A view of Princess Elisabeth Base from the "leading edge" that faces the wind, the garage is below the level of the other side of the ridge from this viewpoint. 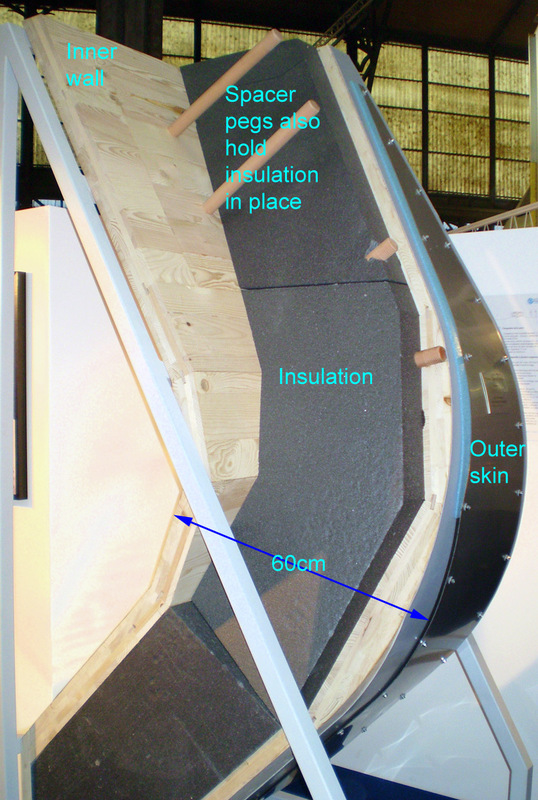 As there is only a short time to build the base in situ, construction is modular - a dry-run in Brussels showed up any potential problems when the base was open briefly to the public, it was then shipped to Antarctica. Statistics (limited at present as this is the first time a base has been built in this area. Base design - hybrid - main base anchored to bedrock on raised legs + garage area dug into the snow on lee side of the rock. Commissioned in 2004, this is a new Antarctic station on which construction started in the summer 2007/2008 season and was first in use on February the 15th 2009. 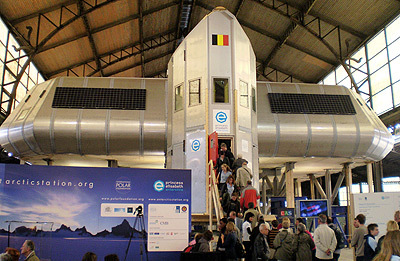 It was part of Belgium's commitment to the International Polar Year (IPY, 2007-2008) and the only new station to be built during this IPY. It was built in a place where no base has previously stood, located on a granite ridge called the Utsteinen ridge near to the Utsteinen Nunatak. A nunatak is a mountain peak that rises above the surrounding ice sheet. It is anchored to the bedrock of the ridge which solves the problem of having to be jacked up as snow accumulates - as in this position, the snow simply doesn't accumulate. The base is held above the ridge on a series of steel legs that are drilled deep into the rock for stability, for ease of construction (the ridge is far from flat) and to ensure that the wind can blow under the base so it doesn't start to cause blown snow to build up. There is a garage unit that is built into the snow slope on the lee side of the ridge accessed by the enclosed stair tower from the main part of the base. It is located in Dronning Maud Land (71°57‚S 23°20‚E¯»¿) 431km (267 miles) from the nearest other base (the Russian Novolazarevskya station) and 190km (118 miles) from the coast. It is however near (173 km 107 miles) - to where Belgium previously had a station called "Roi Baudouin" for about ten years following the International Geophysical Year, IGY (1957-1958). 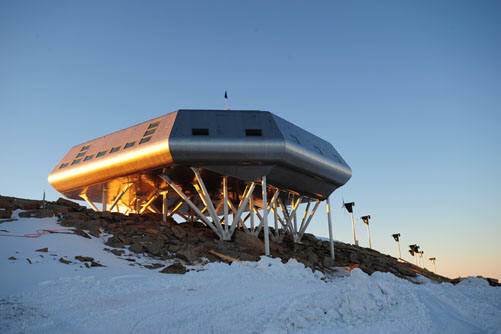 This base was abandoned in 1967 buried under metres of snow. The new location is rather more protected than the Roi Baudouin base which suffered from high snow accumulation rates and very strong katabatic winds. It is situated in a part of Antarctica where there is a very large unoccupied stretch and where there has been little study since the first IGY from 1957-58. The base was designed using eco-friendly construction materials and to be the first zero-emissions polar base running entirely on solar and wind energy. Most of the heating is passive coming from sunlight shining through the large windows, from the body heat of people working on the base and from the waste heat of the base's electrical appliances. There are also a pair of back-up diesel generators. It is a summer-only station designed to house up to 20 people, (but 12 optimally) scientists and support staff from November to February (it is unlikely to be able to be zero-emission if it was occupied year-round). There is 900 square metres of accommodation space. There is capability for the station to become full year-round with little extra effort. It has a minimum lifespan expectancy of 25 years. Wind power is a more viable solution in Antarctica than almost anywhere else as it is the windiest continent. There are the usual problems though that peak demand doesn't always coincide with peak power, a number of lead-acid batteries are therefore stored in the station for back-up. The wind in Antarctica can get so strong that it can damage windmills with constant speeds of up to 125 km/h (77 mph) and gusts of over 300 km/h (186 mph) in this region. The turbines are particularly robust models therefore, there are nine of them generating 6kWh each, 54kWh in total. The station has 379.5 square meters worth of photovoltaic solar panels enough to generate 50.6kWh and also 24 square meters of thermal solar panels to generate heat to heat water. A large part of the zero-emissions target is met by having very good insulation, the outer skin is stainless steel and there are 9 layers in total to maximize insulation and minimize heat transfer. The windows are triple glazed with 40cm (!) between the inner and outer glass. Water recycling - The Princess Elisabeth station treats all of it's waste water to make it cleaner and re-uses 60% of it using bioreactors and filtration units developed for space travel. Waste water is then removed to a crevasse beneath the base.